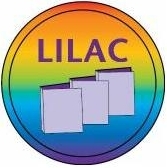 LILAC (Lesbian Information, Library and Archives Centre) is Wellington's lending library for women whose primary relationships are with women. It operates from a room at 187 Willis Street (2nd floor) - see the Location page for a map and bus routes to LILAC. There is flat access from the street and a lift to the 2nd floor. Come in and look around the collection, join or renew your membership. LILAC's current art exhibition is a display of lesbian and feminist postcards, greeting cards and cartoons - both from New Zealand and overseas - a collection owned by Sue Alexander. LILAC has a service at the monthly Kapiti Coasters pot-luck dinners - see the Membership page for more information. Check the new titles page for our latest additions - with links to reviews. The Interviews with authors section on our Web links page has ... links to interviews with authors, audio, video and text. LILAC volunteer Sue collects articles from (mainstream) magazines and newspapers about lesbians, fliers for events, and the like. She welcomes contributions from sources she may not usually see. There is a pink folder at LILAC containing a sample of the clippings - the contents are changed monthly. Check it out when you visit the library ... you'll be amazed at what turns up in women's magazines these days!